Departing Cairo, Egypt round-trip. 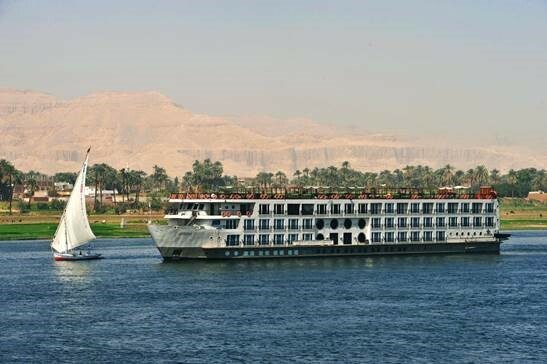 Visiting Giza Pyramids, Skakara Step Pyramid, Cairo Museum, Luxor and Nile River Cruise, Edfu, Aswan, Kom Ombo. - Accommodation for 4 nights in Cairo including daily breakfast. - Personal spending like drinks during meals and onboard the cruise, laundry, phone calls, spa appointments, etc. All advertised events are exclusive to guests who book through Aquafest only. Aquafest Cruises are group events and not chartered vessels. All rates are cruise only and per person, based on double occupancy subject to availability at time of booking. Non-discountable fees and taxes, airfare, air taxes and transfers are additional. A $30 processing fee is addition and subject to change without notice. Events based on a minimum of 30 group passengers. Pricing and other information may change without notice. We reserve the right to correct errors. Information and pricing are subject to change without notice. All cancellations are subject to a $50 per booking cancellation fee from Aquafest in addition to any vendor cancellation penalties. Trip Cancellation Insurance is strongly recommended for all reservations. More information will be provided to you at the time of booking confirmation. Please contact us for a more detailed description of restrictions, cancellations, and penalties.